The comfort of a house but with the conviviality of a campsite. This sentence sums up perfectly your holiday in a mobile home! Enjoy our very nice rentals where you will find all the important conveniences of home. All rentals are equipped with an area to park your vehicle. 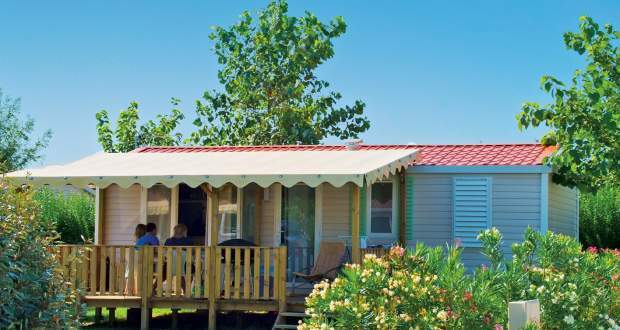 Comfort, tranquility and well-being: your future holiday in our mobile homes! Our mobile homes are spacious, comfortable, surrounded by greenery, and fully equipped. 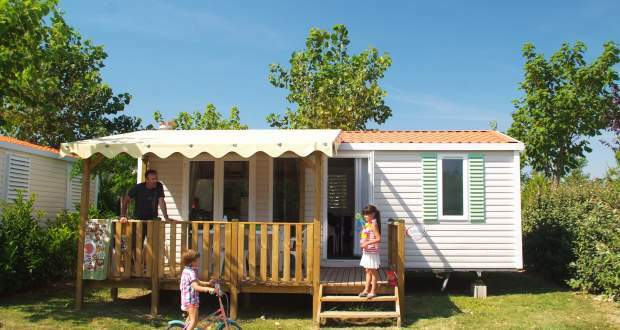 Our accommodation meets all the needs of visitors who come to the Drôme looking to rent a mobile home in a family campsite. 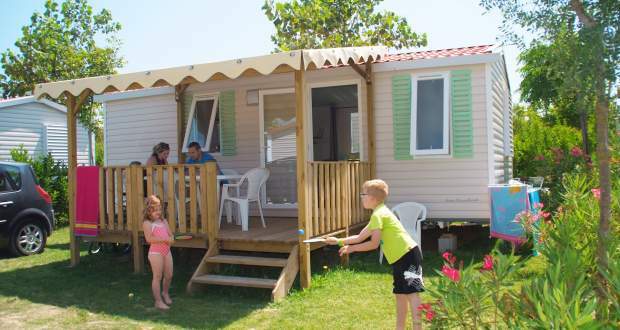 Mobile homes at Soleil Fruité campsite can host up to 6 people, with 2 or 3 bedrooms (single or double beds), and are ideal for families. We provide all the necessary comfort for a pleasant stay: kitchen equipped with crockery and electrical appliances (hobs, large fridge, microwave), sofa-lounge area, bathroom, separate toilet, etc. When you book your stay with us, select ‘Kiwi’ or ‘Family’ mobile homes if you would like to have a TV during your stay. All of our accommodation pitches are demarcated with natural hedgerows to offer you optimal comfort and privacy. 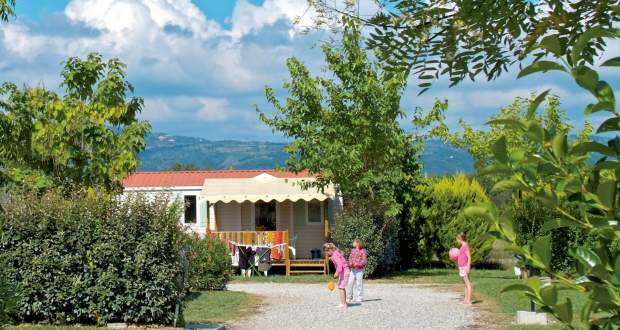 Choosing to stay in one of our mobile homes will provide you with the tranquillity of a family-run campsite, in the heart of the Drôme region. Blankets and pillows are provided. Bedsheets are not provided, but we do offer a bedsheet and pillowcase rental service. We also offer a rental service for baby kits which include a bath, high chair, and cot. 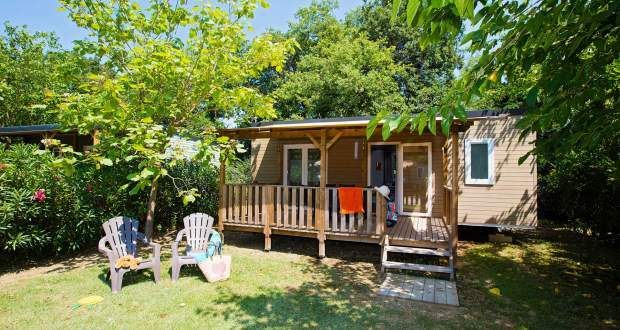 To make your stay in Châteauneuf-sur-Isère as pleasant as possible, all of our mobile homes are equipped with reverse cycle air conditioning systems and have a sheltered wooden terrace that blends in perfectly with the surroundings. Enjoy cycle rides around the campsite, between the towns of Valence and Romans on recently built cycle paths that will take you on safe routes along the Rhône and Isère rivers.